Thanks to Espo’s Powder Coating for providing a great example of proper masking with this turbocharger housing. Regardless of what you’re powder coating, there will likely be an area on your part where you DO NOT want any powder coating to be applied. 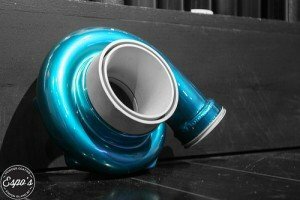 Screw holes, pipe fittings, precisely machined surfaces and sleeves or cylinder interiors are some of the places where powder will interfere with the fitment needed during assembly. If powder gets in the wrong place, it can definitely cause problems down the line. Thankfully, there are a couple easy techniques you can use to prevent powder from going where you don’t want. By using “masking” and “plugs,” you can get the results you need. This article explains when to use masking and plugs for powder coating and also describes the supplies you’ll need in order to use either method. Follow these simple tips and you’ll soon be producing incredible-looking finishes that fit together perfectly during assembly. Masking is the term we use when we want to shield fairly large areas of a part during the powder coating process. For powder coating masking, a high-temperature masking tape is required. Some companies use the term “high-temperature masking film,” especially for larger tape sizes or material that can be cut into sheets. Remember: Powder curing typically takes place between 380° F and 450° F, so be sure that your masking material is rated for those temperatures before using. Masking is usually done after the chemical pretreatment stage of your coating process. Follow your pretreatment steps as normal and allow the part to dry fully before applying the high-temp tape to any areas that require masking. The pretreatment process will provide the uncoated metal with some amount of corrosion protection prior to assembly. If the metal requires blasting prior to coating and needs to be masked before blasting, you will need a different, more durable tape. Resilient high-temp tapes can be left in place, but they are usually fairly expensive. Alternatively, you can also use a thicker version of normal masking tape. You would apply it for the blasting process, remove it after the part has been blasted, and then apply high-temp tape over the areas you want to shield. If you use chemical pretreatment after blasting a part, be sure all tape is removed before the part is treated. Mask the part with high-temperature tape only after it has dried fully and you’re ready to coat. When working with high-temp masking tape, the tape stays in place while the part is being sprayed and cured. You should be able to coat and cure the part as usual after the tape has been applied. Once the part is fully cured, you remove the tape. TIP: When removing the tape, try to take it off while the part is still fairly hot. Around 200° F is the optimal temperature to remove the tape. If you take it off too early, while the part is too hot, it can cause strings of powder to pull off at the edge of the tape and result in a defective finish. If you wait until the part is too cool, there can be chipping or a rough line along the edge of the coating when the tape is removed. Two-tone and multi-color finishes are achieved when two or more different colors of powder are applied to the same part. High-temperature tape and/or masking film is used to achieve this type of finish. 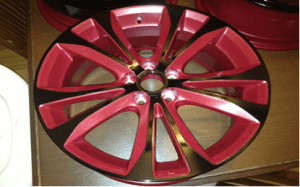 A two-tone finish is applied like any other powder coating that requires masking, but special care should be taken to ensure that the results are acceptable. When applying two-tone or multi-color finishes, you may need to use slightly different masking, coating and curing techniques than you normally would. You’re still dealing with a situation where you’ll be spraying a part and some portion of the part shouldn’t have any powder applied to it, but you will need to spray and cure the part more than just once. When masking the part, always try to limit skin contact on the bare metal. Your skin has oils that can cause issues later when you apply the remaining color(s). As with normal masking, take the tape off of the part when it is around 200° F. A handheld laser-pointer IR temperature gauge is good enough for checking the metal temperature after curing, once the part is outside of the oven. Make sure the first coat is fully cured and cooled before re-taping for the second color. The adhesive on the tape can cause finish problems if the powder has not fully cured. Also, you may want to wipe the remaining bare metal surface with alcohol before coating just to make sure no contaminants are still on the surface from the previous masking. For multi-color finishes, you’ll re-mask the part after each coat has been applied and cured. Check with your powder provider in advance to be sure that the powder you’ll be working with is appropriate for two-tone or multi-color applications. You’ll also want to consider just how long to cure the part each time you spray a new section. You may need to adjust the curing temperature to assure that each coat is adequately cured without becoming discolored. It is easy to under-cure the last coat if you become concerned about over-curing previously applied powder. Remember that most powders are hard to over-bake if you are careful. Two-tone finishes require extra care to get right, especially if the line between one color and the other is on a flat or oddly contoured surface. Extra care when masking can make the difference between a great finished product and a reject, so take your time. Plugs are commonly used to keep powder out of screw holes or other recesses where powder would interfere with the assembly of a part or its working operation. Remember: Just like masking, make sure your high-temperature plugs are rated for the appropriate oven temperature. Always check the temperature rating on the plug before using. Like tape, plugs are also used after pretreatment. Prior to inserting the plugs, blow out the holes with compressed air to ensure all moisture is out of the part. Trapped moisture in hard-to-reach areas can cause surface defects if the moisture leaks from the part during the curing cycle. Plugs can be reused, as long as they do not get impregnated with powder. When reusing plugs, try to remove as much old powder as possible from the plug to keep from contaminating the next part. TIP: When removing the plug, try to remove it when the part is around 200° F for the same reason as when using tape. You’ll get cleaner edges and have fewer defects. Your finish quality is tied directly to the tools you use. If you’re going to be doing professional quality work, you need professional quality powder coating equipment. Reliant Finishing Systems only partners with premium quality, brand-name powder gun manufacturers like Wagner. We only integrate premium component for use with powder coating booths and powder curing ovens. Looking to upgrade your powder coating results? Let Reliant help you with the equipment and support you need. Give us a call today. This entry was posted in News on September 22, 2016 by Bruce Chirrey.